These steps show you how to migrate your files, emails, contacts, and calendar items from your school sponsored Office 365 ProPlus account to your new Office 365 Personal account for Windows 8.1. A Windows device with enough free storage space to hold all the files, emails, contacts and calendar items that you are moving. 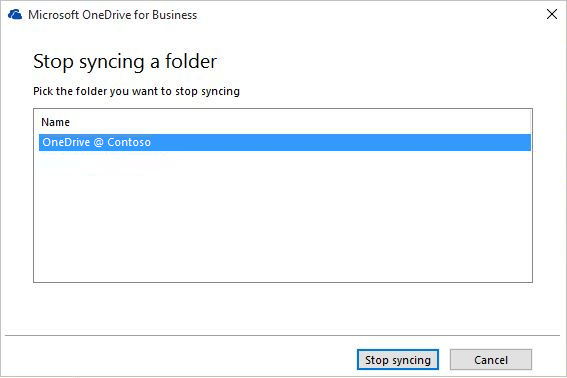 Before beginning, users should first confirm that the existing OneDrive for Business sync client is not actively syncing files. If it is, we recommend that users wait for those updates to finish syncing before proceeding, to give those changes time to propagate to the cloud. Confirm that any active file uploads or edits are finished and fully reflected on the website. In the taskbar notification area, right-click the blue OneDrive for Business cloud icon. If Stop syncing a folder is greyed out, skip to step 5. If Stop syncing a folder is available, click it and make sure that your OneDrive – [OrganizationName] folder doesn't appear in that list. If it does appear, select it and click the Stop syncing button. You are done when the folder for your OneDrive for Business no longer appears in this list. To exit groove.exe, right-click its blue cloud icon in the taskbar notification area and select Exit. Note: Besides preserving the local files, the last step has the added benefit of intentionally invalidating any links to the documents in this folder in any of the Recent lists in the Office apps. Otherwise, users run the risk of updating these files and expecting them to sync, not remembering that they've disconnected sync for that folder. 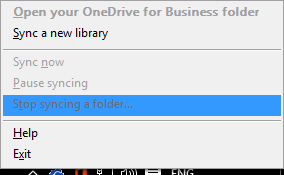 Keep and simply rename the local folder previously created by the existing OneDrive for Business sync client. Open Windows Explorer and rename the local folder previously used by the existing OneDrive for Business sync client (for example, OneDrive - Contoso.old). Important: Write down the full path to your renamed OneDrive for Business folder. You will need to get back to this folder in a later step. Open Control Panel and click Programs, Programs and Features. In the list of programs, right click OneDrive and select uninstall. In this portion of your migration you export email information to a file on your device. Be sure that you have enough room on your device to hold all the emails, contacts and calendar items in your mailbox. If your ribbon has a File option in the top left corner, then you're using a desktop version of Outlook and you're in the right place! If your ribbon doesn't have a "File" option in the top left corner, see What version of Outlook do I have? to determine your version of Outlook and to get to the right export instructions. Open your Office 365 ProPlus school mailbox in Outlook and export your email, contacts, and calendar by following the Outlook 2013 and 2016: Export Outlook items to a .pst file steps found in Export or backup email, contacts, and calendar to an Outlook .pst file. Be sure to select top level folder of your mailbox to export from and to include all subfolders. After you finish the migration and are using your Office 365 Personal mailbox , your school mailbox will still be able to receive mail. To make sure that you get all email sent to your school mailbox after you migrate , you need to create a forwarding rule. The forwarding rule will send all the email to your new Office 365 Personal mailbox and then delete it from your school mailbox. In Outlook click the File tab. In the right pane, click Manage Rules & Alerts. In the Rules and Alerts box, on the E-mail Rules tab, click New Rule. Under Step 1: Select a template, select the Apply rule on messages I receive template from the Start from a blank rulelist of templates. Click Next. Under Step 1: Select conditions(s), select the where my name is in the To or Cc box and click Next. In the Step 1: Select actions(s) select forward it to people or public group and delete it.. Under Step 2: Edit the rule description (click an underlined value), click the people or public group link and type in your Office 365 Personal email address in the To -> box. Click Ok and Next. Click Finish, then Apply, and OK .
Place the message that you want all senders to receive in both the Inside My Organization and Outside My Organization tabs. On the Outside My Organization tab, select the Auto-reply to people outside my organization and Anyone outside my organization options to make sure the everyone gets your new email address if you want. Set up an Automatic Replies (Out of Office) rule on your school email account to notify all senders of your new email address by following the steps in Send automatic "Out-of-Office" replies from Outlook for Windows. In Outlook, sign out of Office 365 ProPlus by clicking File, Office Account, and Sign out. Close Outlook and all other Office applications. Now that you have all your email, contacts and calendar items in an Outlook .pst file and a backup folder of your school OneDrive for Business folders, you can prepare your computer for the new Office 365 Personal applications and services. For Windows 8.1 you must logon to your local computer with your Office 365 Personal account in order to connect to your OneDrive. To do this you have to add your account to your computer. In the How will this person sign in? area, type in your Office 365 Personal email address, click Next. If this is the first time you have signed in to this computer with your Office 365 Personal account you will need to go through some additional steps to make sure you are you. Follow the steps on the Help us protect your info page and click Next. Enter the code your received and click Next. On the How should we set up your PC? page click the existing PC option. Click Next. OneDrive will finish setting up and sync your files from your Office 365 PersonalOneDrive to your local computer from your if there are any there.. In File Explorer open your school Office 365 ProPlus folder (refer to the path that you wrote down in Step 2: Clean up the local folder from the existing OneDrive_for_Business client and uninstall OneDrive_for_Business. Copy and paste the contents of the your school OneDrive for Business folder into your Office 365 PersonalOneDrivefolder structure. You need to re-install the Microsoft Office applications that come with your Office 365 Personal subscription. Install Office 2016 on your Windows 8.1computer by following the steps in: Install Office on your PC or Mac. In Control Panel, click or double-click Mail. Mail appears in different Control Panel locations depending on the version of the Microsoft Windows operating system, Control Panel view selected, and whether a 32- or 64-bit operating system or version of Microsoft Outlook is installed. The easiest way to locate Mail is to open Control Panel in Windows, and then in the Search box at the top of window, type Mail. In Control Panel for Windows XP, type Mail in the Address box. Note: The Mail icon appears after Outlook starts for the first time. The title bar of the Mail Setup dialog box contains the name of the current profile. To select a different existing profile, click Show Profiles, select the profile name, and then click Properties. If your old school email profile is still listed there, select it and click Remove. Type a name for the profile, and then click OK. Enter your password, if prompted. click Finish and Apply and OK. Follow the steps in the Outlook 2013 and 2016: Import Outlook items from a .pst file section of Import email, contacts, and calendar from an Outlook .pst file article. Import the .pst file that you saved in Step 3: Export your school mailbox.